Breakin News India 360: Kieron Pollard 7000* runs 'NOT OUT'! Kieron Pollard has took 361 games to reach this milestone and by doing so, the Caribbean All-rounder became only the fifth player to make 7000 runs in T-20 cricket games history ever. West Indies's star player Kieron Pollard has became the latest entrant in the 7000 runs club in the T-20 cricket format of the game. He needed 33 runs ahead of Mumbai Indians match against Royal Challengers Bangalore in Chinnaswamy Stadium at Bangalore on Friday 14th April. 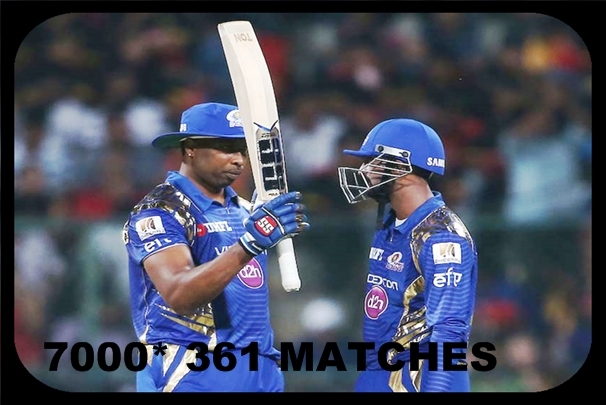 Pollard scored here 70 runs of just 47 deliveries which included 3 Fours and 5 huge Sixes that helped Mumbai Indians to defeat Royal Challengers Bangalore by 4wickets at their home. With win Mumbai Indians jumped to the top of the IPL points table. Kieron Pollard has took 361 games to reach this milestone and by doing so, the Caribbean All- rounder became only the fifth player to make 7000 runs in T-20 cricket games history ever. 1) Chris Gayle: 9997 runs in 289 matches. 2) Brendon McCullum : 7411 runs in 269 matches. 3) Brad Hodge : 7338 runs in 270 matches. 4) Davide Warner : 7011 runs in 224 matches.